We recovered from the H.I.M. Marriage Conference just in time to head to Wayne, Pennsylvania, to speak for Church of the Savior’s annual conference. It was such a privilege to return to Church of the Savior (COS). 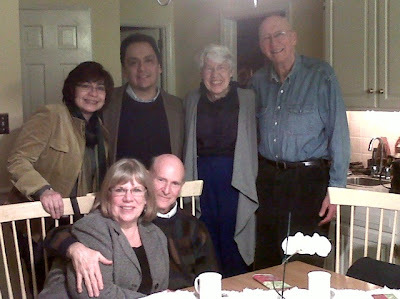 We had spoken there twice before, once on parenting and once on marriage, and both were organized by our dear friends John and Marilyn Nugent. With Nugents no longer at COS due to their relocation to San Francisco, we were delightfully surprised to hear from Ron Perry, the family pastor at COS, inviting us back. We love that church and we love Ron and Kathleen Perry’s heart for marriages and families. They are doing some very innovative and proactive programs for equipping their people and we consider it an honor to partner with them. The conference kicked off Friday evening with two sessions and dessert in between. Ron and Kathleen Perry not only ran the evening, but they baked all the desserts for it as well. No Costco desserts here! They did a beautiful job and everyone who attended was truly blessed by the care and love invested in making it so lovely. “I wanted to thank you again for all that you and Paul shared this weekend at the marriage seminar. My husband and I both appreciated your honesty and transparency. We have had some good conversations as a result. Ron and Kathleen Perry, family pastor at Church of the Savior, baked all the desserts for the crowd of over 200 who came out for the first two sessions of the marriage conference Friday night. What a labor of love! After the conference ended Saturday afternoon, we had a small break before having dinner with their part of their marriage team who plan and promote marriages at COS. We shared lively discussions at the table among the four couples, which included the Palominos, the Shores, the Perrys, and us. All of us share a deep passion for growing marriages and families in Christlikeness, so we found the evening stimulating and encouraging. Part of the COS marriage team—the Perrys, the Palominos, and the Shores—returned to the Shores’ home for dessert after a wonderful dinner out Saturday night following the marriage conference. We wrapped up our time at COS Sunday morning teaching their marriage Sunday School class. We found the same eager and open receptivity to the teaching as we had all weekend. 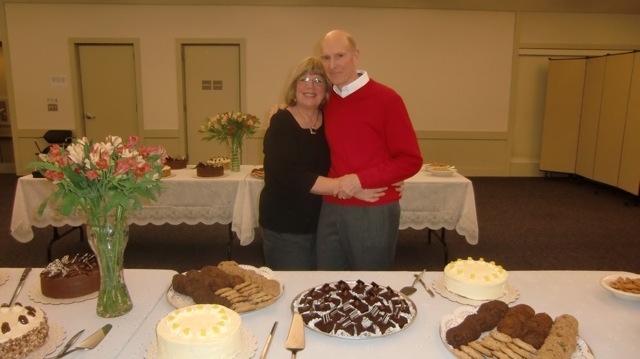 Ron and Kathleen are spearheading a vital and critical ministry at COS and are a huge blessing to that congregation. Bill and JoAnn Shore are the “salt of the earth” and served as our hosts for the weekend at COS.
As much as we loved the hands-on ministry opportunities at COS, the highlight for us personally was getting to hang out with Bill and JoAnn Shore. As part of the founding team of COS over 40 years ago, everyone who’s been a part of COS since its inception are familiar with the Shores and would probably understand why I said they were the highlight of our time. Bill, who will be 81 this year, and JoAnn, his young bride of 79, will celebrate 59 years of marriage this year. They are the epitome of those the Psalmist refers to as being “green with sap” as they continue to make kingdom work the driving force of their existence. Their hospitality is bar-setting, from simple and delicious home cooked meals, to their relaxed, make-yourself-at-home attitude. Their passion for God, His Word, and His people is inspiring. Their tireless serving is impressive. None of the “we served for years—now it’s your turn” attitude was minable. And their love for each other was so hope-giving. They are living models of God’s design for marriage. Theirs really does reflect His glory. “We just spent the weekend with Bill and JoAnn Shore as our hosts while we were doing a marriage conference at their church. Bill is 81 and JoAnn is 79. This is a couple that delights in each other. On Sunday, in order to arrive for the early service, Virginia and I snuck out of the house around 7:30 am. After church we mentioned our concern that we may have wakened them when we left. Bill said, ‘Oh, we were awake at 7 but stayed in bed and… well I guess you know.’ They are a delightful couple and delight in each other. Every meal we ate together Bill would give JoAnn a kiss just after the prayer for the meal. I noticed every time he walked past her in the house he would pinch her bottom or give it a loving smack. 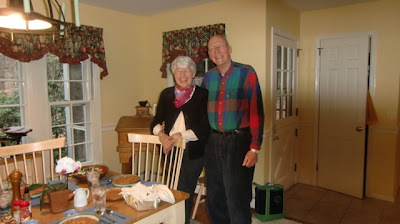 Bill and JoAnn have been married 59 years. When we asked them, ‘If you had it to do over again, what would you have done differently?’ they both said, ‘Come to Christ at an earlier age.’ You don’t have to hang around Bill and JoAnn long to see their relationship with Christ is most important to them. At 79 and 81, they are hosting dinners, Bible Studies, discipling men and women. One teacher at the church was pointed out as the 5th generation of those Bill has discipled who have then discipled others. Every church needs a Bill and JoAnn Shore in their congregation. They are truly the salt of the earth. 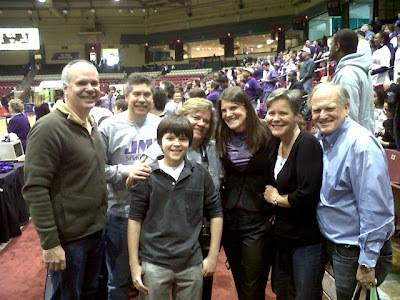 One added bonus for us that weekend: as only God could orchestrate, James Madison University’s women’s basketball team, whose phenomenal athletic trainer is our daughter Lisa, was playing the championship round for the Colonial Athletic Association’s title Sunday afternoon, just 2 hours from COS. The opportunity was too good to pass up, so when Sunday School ended, we hopped in the rental car loaded with Paul’s world famous chocolate chip cookies (thanks to JoAnn Shore’s amazingly equipped kitchen and pantry!) and we drove straight to the arena. It was such a thrill to cheer the Lady Dukes on to victory and to see them honored for all of their hard work and excellence on the court. The win got them a bid to the first round of the NCAA tournament the following weekend (which, sadly, they lost). But it was nothing but joy that Sunday afternoon and we felt so gifted to be there. Back to the Shores for dinner and interesting conversations about our life stories and such before hitting the hay in a state of exhaustion. Though only getting 4 hours of sleep before departing at the ungodly hour of 4 am for our flight to Hawaii, we voiced no complaints, knowing we’d have 12 hours of airtime to sleep en route to Kona. And that will be a story for my next blog. Besides getting to see the Lady Dukes win the CAA Championship, we got to spend a few hours with my brother Frank (far left) and his son Chris, and my sister Laura and her husband David, and of course Lisa, the athletic trainer who kept that championship team on the court with her endless hours of treatments and rehab. What a treat to be there!